Khao Ito is a newly designated Forestry Park within a short distance of the Wild Lodge. The park can be reached by an off-road track just though Tambon Noen Hom. The park is administrated by a small band of rangers and surrounds the twin Chakrapong Reservoirs. The resevoirs are overlooked by Khao Ito mountain which provides perhaps the most accessible downhill mountain biking in Thailand. In the surrounding eucalyptus forest the trails are mostly single track, with some technical challenges, some great climbs and of course the accompanying descents. The views are superb and the trails very quiet. The trails will change with the seasons and even wet weather offers some riding that will test your skills and nerve. This is some of the best easy access, one day riding you will do in Thailand. 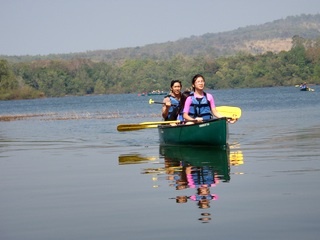 As well as bikers Khao Ito reservoir itself can offer a great location to learn the basics of open canoeing and a stealthy paddle to the further shores of the main lake reveals a large variety of bird life and it is a must to sit either on the water or the shores of the lake watching the sunset behind the mountain.